"Britain's pig farmers want you to Stand by Your Ham," reports the WSJ. "The Tammy Wynette classic [the same one Hillary voted against before she voted for it* way back when] altered in praise of bacon and sung by a crew of pig raisers, is part of an effort to pressure the United Kingdom's dominant supermarket chains into paying struggling farmers more for their meat. Also part of the campaign: a 500-pound mascot sow called Winnie and a big pink plywood cut-out pig that counts how much money U.K.'s pork farmers are losing." 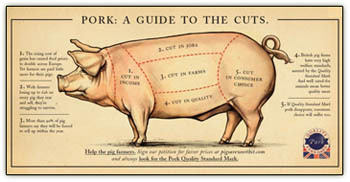 "A play on the traditional guide to pork cuts," this London Underground "advert outlines in no uncertain terms the five key cuts threatening the pig industry -- income, jobs, farms, quality and consumer choice," says Pigs Are Worth It. "But while the campaign is getting attention, it isn't clear that it will cure the farmers' financial troubles," adds the WSJ. Exploding global grain prices have driven up the cost of animal feed and farmers say they're now selling every pig they raise at a $50 loss. Many farms could go belly up, they warn. Global wheat prices have more than doubled since November 2006, as harvests fail in places such as Australia, more agricultural land is diverted to biofuel production, and growing affluence in China and India boosts demand for grains. A British government scientist said earlier this month that global grain stores are currently at their lowest levels ever, just 40 days from running out. "More people are coming to the conclusion that there is a food-fuel link," says Siwa Msangi of the International Food Policy Research Institute (IFPRI), a Washington food-security research organization. "The historic pattern of the past, where food prices were in a long-term decline, could be at an end." But the major reason grain prices are spiking, he and others note, is fast-rising demand for higher-quality food like meat, poultry, and dairy products by the increasingly affluent people of China and India. Still, biofuels play a role in higher grain prices, says Dr. Babcock. "But about 10 years ago, things started to get lean [when] the U.K. government introduced higher welfare standards for pigs, banning the practice of caging sows in narrow stalls and chaining them during their four-month pregnancies. That forced farmers to invest in more barn space and equipment. Costs rose and farmers fled the sector. The U.K.'s breeding herd has fallen to about 425,000 -- half the size it was in 1990. Now, soaring feed prices have tipped the industry into crisis." "Trust me, Wilbur. People are very gullible. They'll believe anything they see in print," spinmistress Charlotte, the barn spider of the title of E.B. 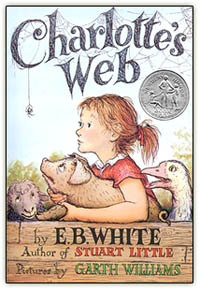 White's Charlotte's Web, told the piglet she would eventually save from the slaughter by writing words in her web -- most famously, "SOME PIG!" -- extolling her friend's excellence. The thought of those pregnant sows trapped in crates where they could not move about nor socialize with their fellow pregnant ladies breaks our heart. Think Charlotte's Web. Pigs are sentient beings with rich psychological lives akin to our own. Why do sausages -- not to mention crown roasts -- have to be so delicious? Update: Linda Chavez expounds on the "government-engineered food crisis" stateside [Thanks for the tip, Goomp]. *From Wikipedia's "Stand by Your Man" entry: The song remained contentious into the early 1990s, when soon-to-be First Lady Hillary Clinton told CBS' 60 Minutes during an interview that she "wasn't some little woman 'standing by my man' like Tammy Wynette." The irony of this statement became apparent during Clinton's impeachment. It sounds like the price of pork is not set by a free enterprise market in Merry Old England. Let us face it: Humans can be very stupid. Oil is being used to produce plants to make alcohol causing a shortage of oil. Numb heads oppose nuclear power which could reduce the dependence on oil. A catastrophic destruction of free society awaits. Life has become too easy and the nutcake liberals think government planning is the answer to all problems. Take it from the past experience of mankind, civilization is at a crisis. Unless the ideals that made The U S A great are followed the future of this country is dismal. I think I'll have a BLT and think on all this while eating it. "Pork fat rules!" - the gospel according to Emeril Lagasse (and me). I'm not sure how they get themselves out of this dilemma - but I think it won't be long before Britain will be importing their pork. That's a shame for them and for the farmers.